The Department of Telecommunication Engineering was started in the academic year 2000-2001. The department currently offers an undergraduate program B.E. Telecommunication Engineering. 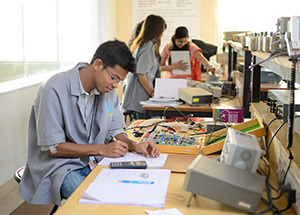 In addition, students who wish to pursue further study in the field can do so through the Department’s M. Tech in Digital Communication Engineering postgraduate programme. To create an ethical human resource, proficient in domains related to Telecommunication Engineering for a successful career in the service of society. M1: Build a staff team with a mixture of people with industrial and academic exposure capable of inspiring, moulding and training young minds to become competent and ethical professionals. 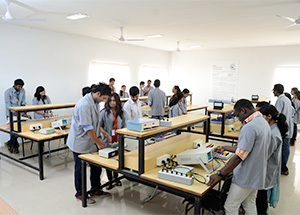 M2: Impart domain-specific knowledge by equipping laboratories and facilitate experiential learning, experimentation and research, based on the foundation of science and mathematics. M3: Ideate and implement interdisciplinary projects and foster continuous learning, in partnership with students and colleagues across disciplines of the institute. M4: Collaborate with academia, industries, organisations and professional bodies for training, consultancy and research. PEO1: To demonstrate domain knowledge in Telecommunication Engineering and the allied fields, to propose solutions for the core industry. PEO2: To update and adapt their core knowledge and abilities to compete in the ever-changing global enterprise. PEO3: To succeed in their chosen career path through life-long learning, by pursuing advanced studies in engineering or science through competitive exams such as: IES, GATE, GRE and GMAT, as well as complementary disciplines. PEO4: To assume leadership roles in industry or public service, through engineering ability, communication skills, teamwork, entrepreneurship, understanding of contemporary global issues, and use of modern engineering tools and software. 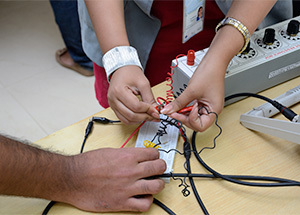 PSO1: Apply principles of electrical and electronic circuit theory to: i) design and simulate basic electronic circuits and; ii) make use of the measuring instruments including the ‘digital storage oscilloscope’ in elaborate circuit analysis and in the design of analogue and digital circuits. 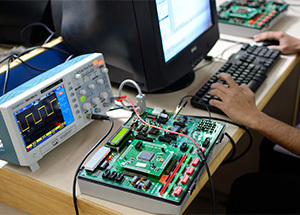 PSO2: Apply principles of mathematics, signal processing and communication theory to analyse different types of signals, operations on signals, design and realisation of simple systems such as digital filters, modulators, demodulators, microwave antennas and resonators, and support communication engineering design activities and VLSI systems. PSO3: Take part in collaborative and consultancy projects as an electronic design engineer and support diverse tasks of circuit design projects, schedule, quality and efficiency management, aswell as documentation and publication of reports.